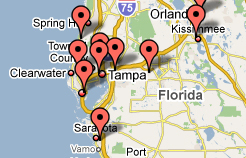 Chapter 7 Tampa bankruptcy allows you to walk away from a mortgage you cannot afford. Chapter 7 will also temporarily stop a foreclosure and give you time to find a new place to live. Chapter 7 is a liquidation rather than a reorganization of debt. There is no payment plan and there is no payment plan to catch up and repay missed mortgage payments. In other words, if you are behind on your mortgage and you file Chapter 7 bankruptcy in Tampa, you will most likely need to surrender your home. When you file a Chapter 7 debt liquidation, you can stop a pending foreclosure for a few weeks to a few months. After you file, the mortgage company will file a motion in bankruptcy court called a motion for relief from stay. In this motion, the lender will ask the Tampa bankruptcy judge to lift bankruptcy protection as to your mortgage so it can restart the foreclosure process. The motion for relief process typically takes about three to four weeks to complete, at which point the lender has to start the Tampa foreclosure process over from the beginning. This means that, in most cases, you will have between four to eight weeks to prepare to move and to find a new place to live. Although filing for Chapter 7 bankruptcy in Tampa will not enable you to keep your home permanently, it will give you breathing room and a chance to move on your terms. Filing Costs: For a Chapter 7 Bankruptcy, the federal filing fee is $335.00. If you qualify we can file your case for as little as $195. Remaining filing fees must be paid within 60 days of file date. Included in your down payment is the mandatory credit counseling certificate cost of $45.00 (this fee includes both the pre-filing and the pre-discharge counseling). This counseling may be done at our office while we are opening the file or online at anytime. We can also obtain your credit report for $15.00 for a single report, $30.00 for a joint report. This is not mandatory, but we find it to be very helpful if you do not have a complete and accurate list of creditors. The balance of the attorney fees can be paid at $250 a month for 4 months. You may pay attorney’s fees and costs by cash, personal check, debit card, money order or checks from a third-party. 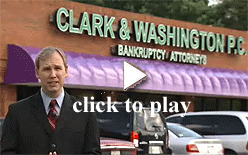 If you are considering filing for Chapter 7 bankruptcy, call Clark & Washington today at 813-345-5954 to discuss your options with a Tampa bankruptcy lawyer.